We have a very exiting meeting on Thursday, February 18, 2016 as we welcome a very special guest; Texas Attorney General Ken Paxton. General Paxton will give us an update from the AG’s office including ongoing lawsuits against the Federal Government. We will also have the pleasure to hear from Texas Eagle Forum Vice President MerryLynn Gerstenschlager who will speak about her observations in Paris, France last December while attending the United Nations Conference on Climate Change. MerryLynn has been an official observer at 21 United Nations conferences, 13 of which have been on the topic of the theory that human activity is causing global warming. We will also hear from candidates on the March 1 primary ballot, including local candidates and candidates for the Texas Supreme Court. We have extended our social to 45 minutes in order to give you a chance to talk to the various candidates and ask them any questions that you might have before you vote. Our social with light dinner/snacks (available as long as they last) begins at 6 PM. The meeting itself will be 6:45-8:15 PM. We are looking forward to seeing many conservative friends on Thursday, February 18! PS. 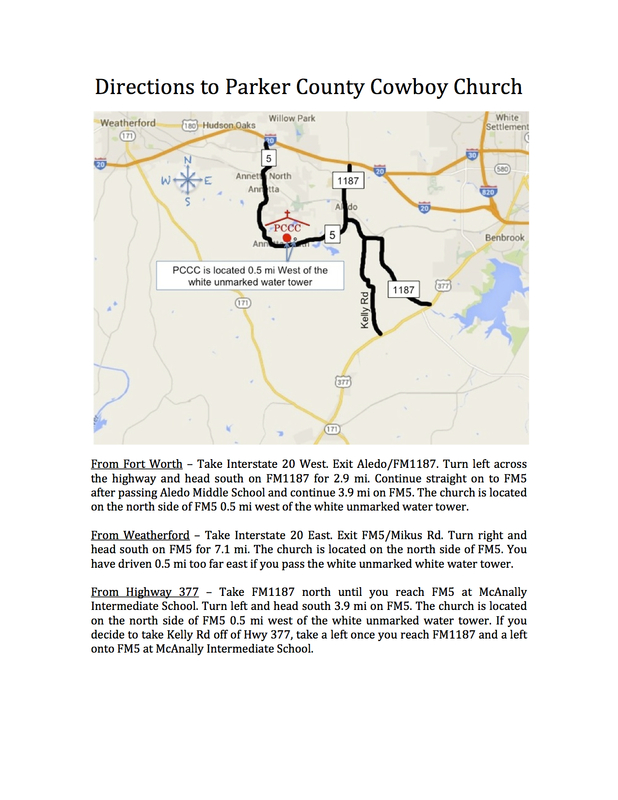 Detailed directions to Parker County Cowboy Church (5050 FM5, Aledo, TX 76008) can be found below. Invite your friends and enjoy a fun evening with like-minded conservatives! From Fort Worth – Take Interstate 20 West. Exit Aledo/FM1187. Turn left across the highway and head south on FM1187 for 2.9 mi. Continue straight on to FM5 after passing Aledo Middle School and continue 3.9 mi on FM5. The church is located on the north side of FM5 0.5 mi west of the white unmarked water tower. From Weatherford – Take Interstate 20 East. Exit FM5/Mikus Rd. Turn right and head south on FM5 for 7.1 mi. The church is located on the north side of FM5. You have driven 0.5 mi too far east if you pass the white unmarked white water tower. From Highway 377 – Take FM1187 north until you reach FM5 at McAnally Intermediate School. Turn left and head south 3.9 mi on FM5. The church is located on the north side of FM5 0.5 mi west of the white unmarked water tower. If you decide to take Kelly Rd off of Hwy 377, take a left once you reach FM1187 and a left onto FM5 at McAnally Intermediate School. Click here to sign up for Parker County Conservatives’ emails.